Where do blog post ideas come from? This one came from someone else’s headline. We are constantly inspired by the amazing work of others, and we owe a lot to the deep thinking and amazing resources that are readily available within the industry. How can we get more ideas more consistently? There’s inspiration everywhere. We’ve just got to keep our eyes open. Copyblogger gave us the inspiration for this post. One of their recent headlines mentioned “idea curation,” a new-to-us term that really hit home. We so often talk about the way we curate content. 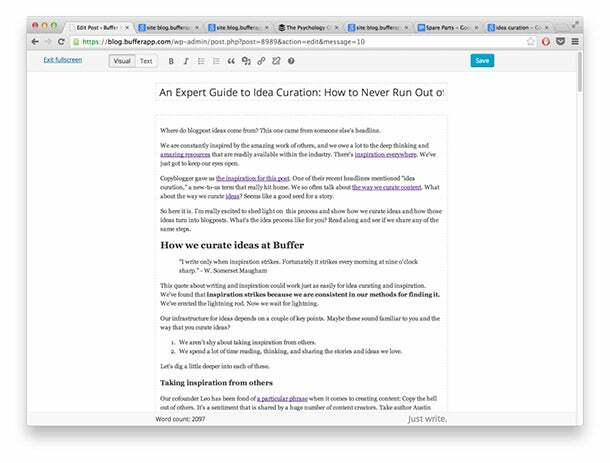 What about the way we curate ideas? Seems like a good seed for a story. So here it is. I’m excited to shed light on this process and show how we curate ideas and how those ideas turn into blogposts. What’s the idea process like for you? Read along and see if we share any of the same steps. This quote about writing and inspiration could work just as easily for idea curating and inspiration. We’ve found that inspiration strikes because we are consistent in our methods for finding it. We’ve erected the lightning rod. Now we wait for lightning. Our infrastructure for ideas depends on a couple of key points. Maybe these sound familiar to you? We aren’t shy about taking inspiration from others. We spend a lot of time reading, thinking, and sharing the stories and ideas we love. Let’s dig a little deeper into each of these. Our cofounder Leo has been fond of a particular phrase when it comes to creating content: Copy the hell out of others. It’s a sentiment that is shared by a huge number of content creators. Take author Austin Kleon, for instance. His bestselling book Steal Like an Artist tackles this topic directly, making the point that every creator takes inspiration from somewhere. And the better you are at seeking out inspiring sources, the better your work can become. In practice, this concept of inspiration takes on a number of unique looks. We have several different ways in which inspiration adds to our list of ideas. We come across articles that we love and want to dive even deeper into. We Crafters have the privilege of time to dig into research and cover all angles of a topic to create an in-depth and actionable post. So when we come across articles with an interesting angle or topic we’re into that might not go as deep into a concept as possible, we often see an opportunity to dig in and take it even further. We find headlines that grab us, and we repurpose them for other topics. Have you ever found just a really solid headline? One that grabbed you, even if the subject wasn’t up your alley? Whenever this happens, we try to take note of the headline and seek new ways to use it somewhere else. Belle took it from there. We learn from what’s worked in the past, and we build, modify, and iterate on the theme. Our archives are a great source of inspiration for what we might write next. We can take a look at what’s worked well in the past and run with those themes for future posts. Our recent post about social media stats came as a sequel to an incredibly popular stats post last summer. The goal is to capitalize on a formula that has worked before. We listen. An incredibly valuable source of inspiration is you, the reader. We listen to blog comments and to conversations on Twitter to see what you’d like to learn more about, what you’re interested in, and where are your pain points. Then we aim to tailor content to provide benefit to you. Our most recent Instagram post came from a comment. A reader noticed that a past Instagram stats post could use a refresh, so we added the idea to our list and came out with something new.
.@buffer these insights are outdated due to recent to the editing capabilities, and "the most effective filter" is a ineffective approach. We take note of our experiences. Inspiration also comes from what we’re learning. We are aware that the kind of topics we’re learning about as we grow Buffer—like A/B testing, SlideShare, and email list building—might be some of the things you’re working on for your own growth and marketing, too, and we use these as sources for ideas. If writing and publishing were our only activities, we’d quickly run out of ideas. The idea process requires our thinking outside the box of content creation and spending time dipping our toes in elsewhere. We often find our inspiration in content curation—the regularly scheduled reading, discovering, and sharing of the best stories online. How do we come across the “best of” content? It requires a lot of reading. 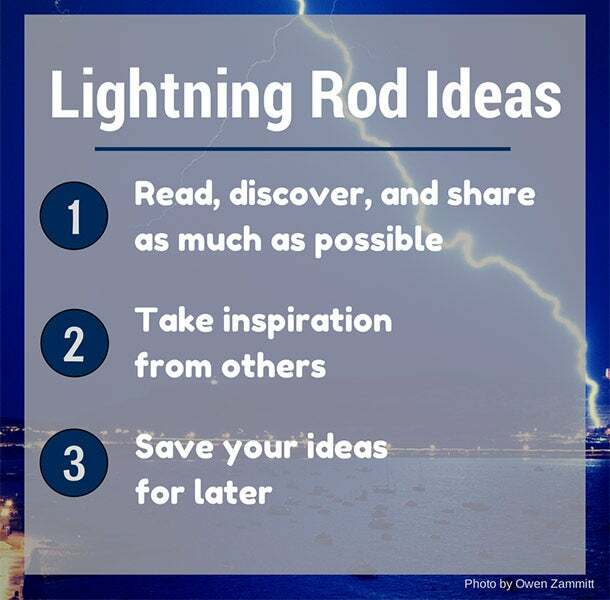 We spend time in a lot of places, soaking in all the content we can get (building the lightning rod, so to speak). 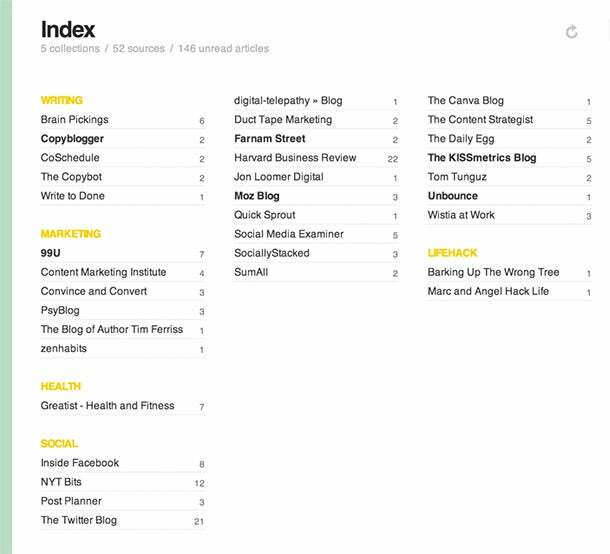 We aim for variety, both in the places we read our content and the tools we use to surface it. So our reading might take us to KISSmetrics, Crazy Egg, and Seth Godin, and we may use RSS, Twitter, and email newsletters to get there. We also benefit from variety among our content team. Courtney and Leo have different sources than I do when it comes to curation. I still don’t know where they find all the great ideas they do (and I’d imagine they wonder where mine come from, too). Of course, the next step after coming up with all these ideas is what to do with them. Here’s how we store our ideas. 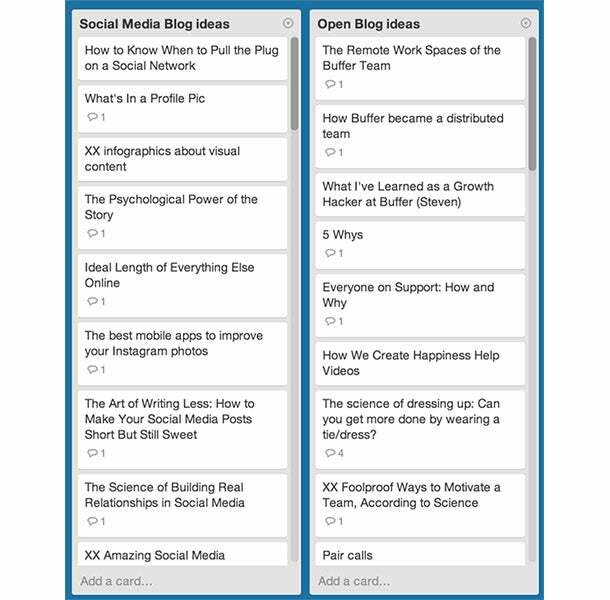 We use Trello to organize our ideas and to assign content for the coming weeks. It’s a rather wide open method of idea curating: Pretty much anything goes. Some ideas are nothing more than a phrase or headline. Others have a half dozen links or comments. We currently have 47 ideas in the list for our social media blog (the one you’re reading now) and 36 ideas for our sibling blog, Open. Do any of the ideas sound like something you might like to read? What our Trello board amounts to is a digital swipe file, a collection of ideas we can reference with ease. Swipe files began as a means for copywriters to store tested and proven advertising letters, and the practice has since blossomed to a huge number of industries. Newspaper reporters call theirs a “morgue” file—it stores the dead things that you’ll reanimate later. Designers and artists have variations of swipe files at Dribbble and Ffffound. The value, as Jerod Morris of Copyblogger so eloquently states it, is that swipe files keep your ideas right within reach so that you’re never without inspiration. Successful writers have a system for recording and recalling ideas… Because if you know that you always have a catalog of great ideas to fall back on for those days when you wake up with nothing fresh in your head, it completely removes that fear of the blank page from the equation. If you’re interested in creating a swipe file for your ideas, you can do like we do and collect things in boards like Trello. Here are a few other of my favorite alternatives, too. Evernote – Probably the most popular bookmarking tool, Evernote has an incredibly deep assortment of clipping and saving features. You can clip inspiration you find online as well as in the real world. Evernote even has image recognition that can pull text from photos. Icebergs – The visual bookmarking service at Icebergs collects screen grabs, uploaded files, text, video, and notes in a beautifully-designed board that you can share and collaborate with team members. Here’s a link to a shared board that I use to grab some favorite GIFs from our Buffer GIF parties. Gimmebar – Much like Icebergs, Gimmebar lets you save whatever inspiration you find online—even bits of text that stand out to you in the body of your posts. It also provides quick and easy linking to tweets and videos. Now that you know where our ideas come from, I thought I’d quickly explain how an idea goes from Trello board to Buffer blogpost. It’s a constantly evolving process; here’s what it looks like now. On Fridays, we brainstorm the best posts for the following week. We generally aim to focus on at least one statistics post or tools post each week. We’ve been focusing on more thoughtful content, too, so that post fills another slot. Other than those, we simply grab what seems like the most relevant, timely, “blogbuster” idea we see. 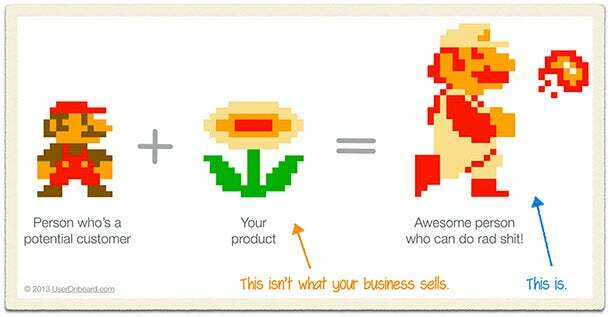 The more actionable, the better. I break each story down into a three-day schedule. 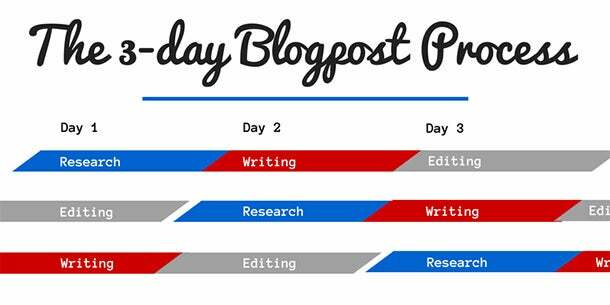 In a perfect world, each day will include one stage from three different blog posts—I’ll research one, write another, and edit a third. Research is where a blog post idea really shows its worth. Sometimes we’ll start with an idea that looks completely different once the research is done. If the sources don’t back up the premise, we can be flexible and evolve the idea in a new direction. Once the research is complete, I place it all into outline form in the post editor, ready for writing on day two. The first draft of my posts are sometimes quite terrible, and this is OK by me. That’s one of the nice reasons to have the writing process spread out over three days. I can write terrible drafts on Day Two and still have time to fix them up on Day Three. This writing step is my excuse to get as many thoughts written down as possible. I write long today, knowing I will edit tomorrow. Also at this stage, I’ll add as many visuals and graphics as I can. By taking a break between writing and editing, I can approach a blog post with a fresh perspective. I have a tendency to get in pretty deep with the stories I write, so I need the space to think and breathe before I edit again. The 24-hour window between writing and editing has been a huge benefit to publishing content I’m confident in. Once the post is out there, we celebrate and share it … and then curate some more. Comments and reaction to the post can be a great source for new ideas—elements we could expound on, parts we missed, areas that really resonated with readers. We’re constantly on the lookout for new ideas as soon as an old idea sees its way through.